Paranoia (par-a-noia), noun; a tendency on the part of an individual or group toward excessive or irrational suspiciousness and distrustfulness of others. Example: You just opened a pack of cards and your worst nightmare is realized, you've pulled an insanely awesome card! You become filled with anxiety as your eyes scan the front of the card, you notice the centering isn't perfect and there is a slight finger print on the surface! It's one thing to care about the condition of your cards, it's quite a different thing to be paranoid about the conditionof your cards. Paranoia is when you see 47-53 centering, the slight finger print on a Bowman Chrome auto, a slightly imperfect corner, or anything that can only be seen after obsessive searching. I'll admit, I've ruined a lot of cards for myself over the years and not one of them involved the mis-handling of the card itself. Instead of leaving an expensive card un-sleeved in a shoe box, I've ruined cards in a much different way, by blowing out of proportion a minor flaw. By seeing things that only a magnifying glass can show me. Condition is certainly important, no one wants a card with a bent corner, crease, smudged signature, or moisture damaged surface. At the same time, condition isn't the end of the world, nor is it even the end of potential value. If cards were meant to be perfect, they would have used metal, plastic, rubber, titanium, gold, silver, or some material far stronger than a sheet of everyday cardboard. In the world of 2010, we are a society that insists upon pursuing the impossible, that being perfection. Instead of using the information at our disposal to enhance the world around us, we use it to do just the opposite, we let information tell us why we shouldn't be excited about life, why something that didn't bother us before should bother us now. "Paralysis by analysis" is a centuries old saying that has found new relevance in the 21st century. 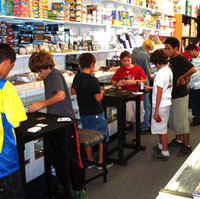 Next time you're at a card show, notice the father and son with a magnifying glass trying to turn cardboard into gold. 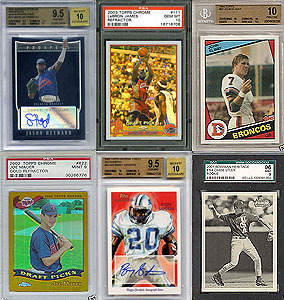 Instead of looking for a great card, collectors are looking for the next Pristine 10 or BGS 9.5. Here's the secret truth about cards, they are supposed to be a fun collectible with value! Cards are much simpler and much more enjoyable than we are led to believe. A card either looks good or doesn't look good, that's for you and no one else to judge. Institutions like PSA and BGS are extremely important assets to the industry, but they are only as valuable as our ability to place them in proper context. We need to remember that the condition of the card will never be as important as the card itself. Collectors shouldn't be afraid of looking at their cards in fear of losing a sub-grade. Cards weren't meant to be defined by the difference between a BGS 9 and a BGS 9.5, they were first and foremost meant to be defined by the player who is captured on the card. Expecting every pack you open to garner 5-pack fresh Gem Mint 10's is as crazy as expecting every lottery ticket you buy to hit the jackpot. Here's my solution: open packs, buy cards, and most importantly enjoy them! Let the imperfections find you instead of you finding them. I'm not saying to look the other way, I'm simply saying that the only imperfections worth worrying about are the ones that steal the show from the card, the ones that truly stick out. I've recently come to grips with the fact that there will never be a card in my collection that doesn't have some minor imperfection. The pursuit of perfection is an illusion, an illusion of grandeur. It is something that you cannot control, therefore it is something that shouldn't ruin collecting for you. All you can do is take care of the cards you have and only worry about condition when it needs to be worried about. Paranoia is not a complex emotion. Paranoia is simply the anxiety we feel when faced with something we cannot control. There's another saying that has survived several centuries that perfectly tells us how to deal with imperfection, that saying, "It is what it is". Instead of focusing a magnifying glass on the cards, we should use it to take a long look at the condition being paranoid about card condition has put us in. Could you imagine how crazy the world would be if we started grading the condition of everything we own? My car would grade out at a BGS 3, but what does that matter if it does what it's supposed to do, drive me from point A to point B.
great article…enjoyed reading that. I struggle with that and I’m just inventorizing my cards into my own personal database. For example, I’ll sit there and study the card to see if it comes up to be very-good/excellent or excellent-near mint. I prolly can’t even tell if I’m grading it right or not. Would you agree that I’m worrying way too much about this? @brady: I would agree, anytime you take over 30 seconds judging the condition of a card is too long. I certainly care a great deal about the condition of my cards, I just don’t think that the imperfections are the end of the world and that we can’t let it impact our enjoyment of the hobby. In all honesty, I used to be terrified to even look at my best cards when I was in my “overanalyzation” stage because I didn’t want to notice some new minor imperfection. Although PSA existed in the 90’s, I think we looked at cards in much better way, a card was mint or not mint, it was that simple. If you collect because you enjoy it and it is you personal collection, I see no reason to overanalyze your cards, especially if you plan on keeping your cards. well the only problem is I’m trying to grade them that way I can always be ready to upload them to my sportsbuy store and sell them. Appreciate the response…tell me tho, would you care if you were buying a card from me and I couldn’t tell the difference between a card’s grade that is excellent-near mint or very good-excellent?? anytime I see the tiniest of crease in the card, it automatically goes to a very-good in my book at the highest. Btw…really like ur site. I think it’d be cool tho if you could get more discussion on here…maybe a chat, forum, etc.??? @brady: Honestly, a crease is more than just a small imperfection. What I was trying to say is the issues that are extremely unnoticable or only visible with a magnifying glass are the ones not worth caring about. What cards are you planning on selling? If they are vintage, than a crease most certainly isn’t the end of the world. We are working on getting more chat going. 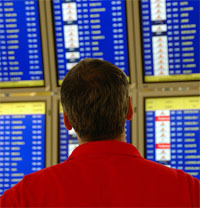 The way our site is set up is more like Facebook than a blog, I think people don’t reallize that or are to shy to talk. I think it would be awesome if more people talked, I am trying to think of ways to encourage readers to talk more, cause I know we have a ton of them. I will say that you are certainly helping a great dea with how often you comment. I appreciate it! Ha, sometimes it can feel like I am talking to myself. I think that it will pick up soon enough, we have some cool things we’re in the process of doing that should help this out. cool…lol as for the crease yea I know that’s a big deal. lol but I was jus saying for my mid 90’s base cards that are just terrible condition, it doesn’t matter whether I grade it very good-excellent or very good or better ya feel me??? Sounds cool…I’d like to ask you some questions in an email? Should I just hit u up on facebook? ?